This is a sponsored post written by me on behalf of COLEMAN NATURAL FOODS®. All opinions are 100% mine. 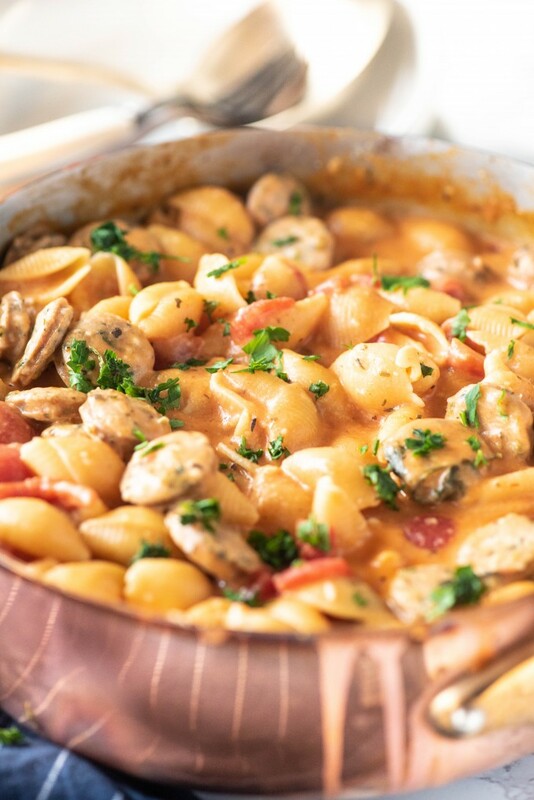 This Cheesy Italian Shells is a fast, easy dinner made for going back to school! 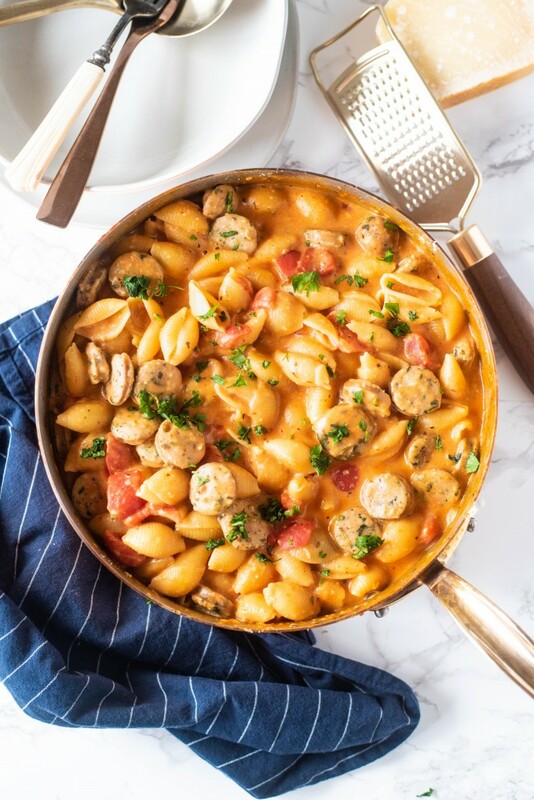 One pot pasta dishes mean less mess to clean up, and everyone always loves the combination of creamy tomato sauce and sausage! It was a big week around here, Jonathan started kindergarten and so I have officially joined the throes of moms everywhere that are thrown into the back to school chaos of reestablishing a routine. Gone are the days of lazy days, come what may be dinner time meals, and late bedtimes after playing outside until the sun has decided to finally go to bed. No, now we’re back to trying to figure out a new routine of pick ups and drop offs and bus stops and pick up times and making sure that the right folders are in our backpacks and that we don’t leave our backpacks on the bus. Now I’m trying to figure out what days I drive Jonathan to school so I can drop Michael off at the sitters at the same time and save myself a second trip. Yes, Michael goes to a sitter two days a week. I can’t get anything done work wise while he’s at home with me. Shocking, I know. And as excited as I am to see Jonathan start this new chapter, it also makes me a little bit sad because it feels like it’s the beginning of the end of carefree days and years. Now our schedule is largely determined by school and homework and activities, for at least the next 20 years as Michael is still a few years behind him. No more random trips to Disney World in the middle of February, no more outings to the zoo and the aquarium on Wednesday morning while the crowds are low. But it’s also the start of a new and exciting chapter as well, as Jonathan starts a new school and makes new friends and learns to read. But back to school really seems to mean back to routine while also simultaneously meeting back to chaos. 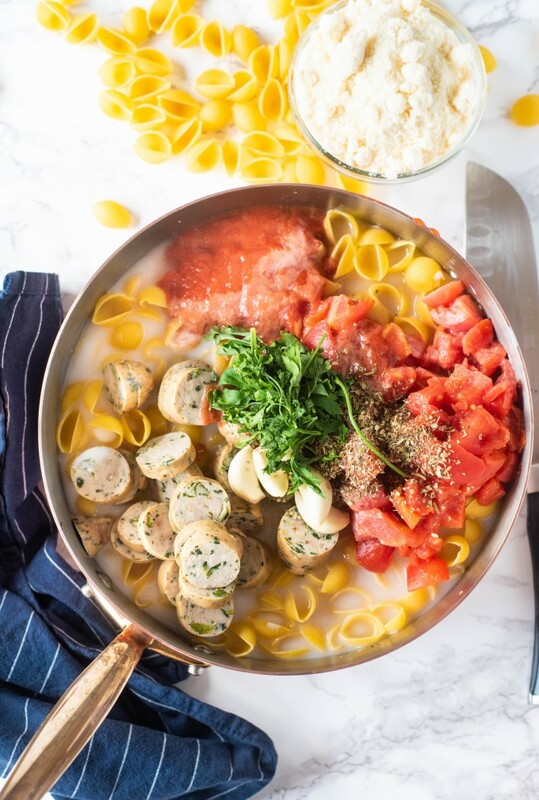 While we establish our new routine, I’m all about easy dinner recipes that require almost no work from me, but that will satisfy the palette of everybody in this family – a tall order on most days! 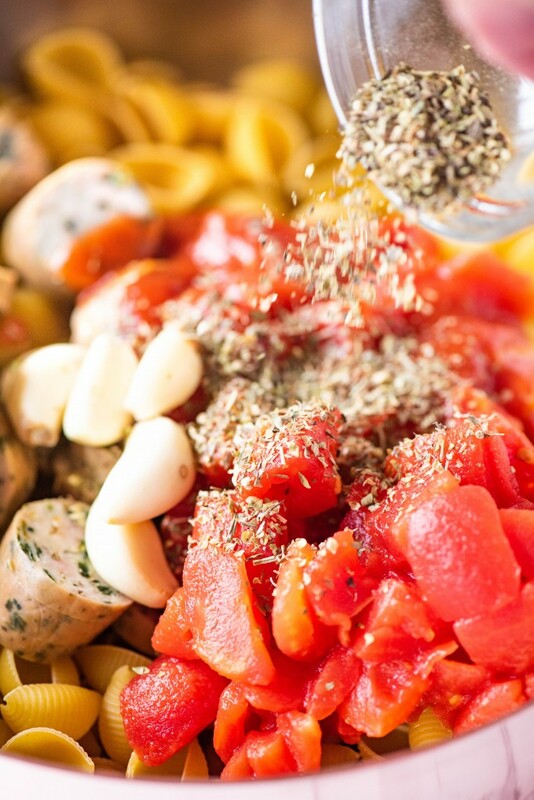 I do love fast, one pot pasta recipes that leave me with almost no dishes to do at the end of dinner, and allows me to get everybody a little bit settled and centered before we eat. 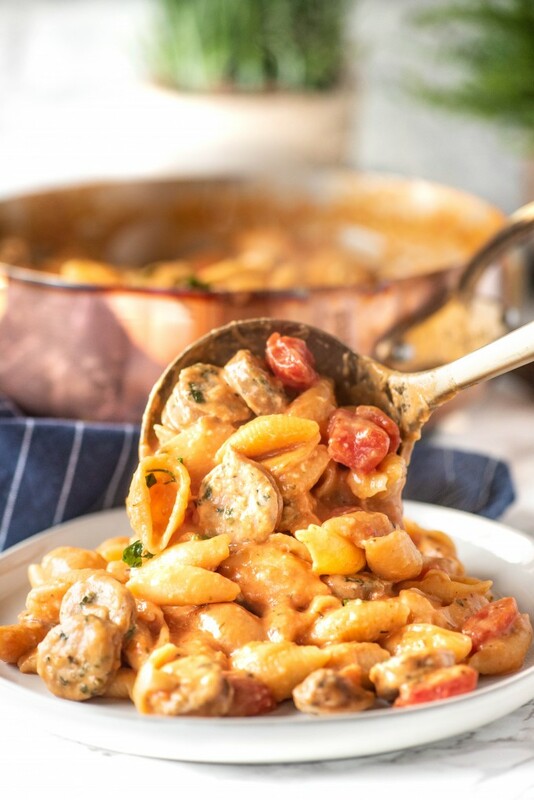 Confession time – while not an everyday thing, I used to keep a couple boxes of hamburger helper in my pantry at all times for last minute dinners. 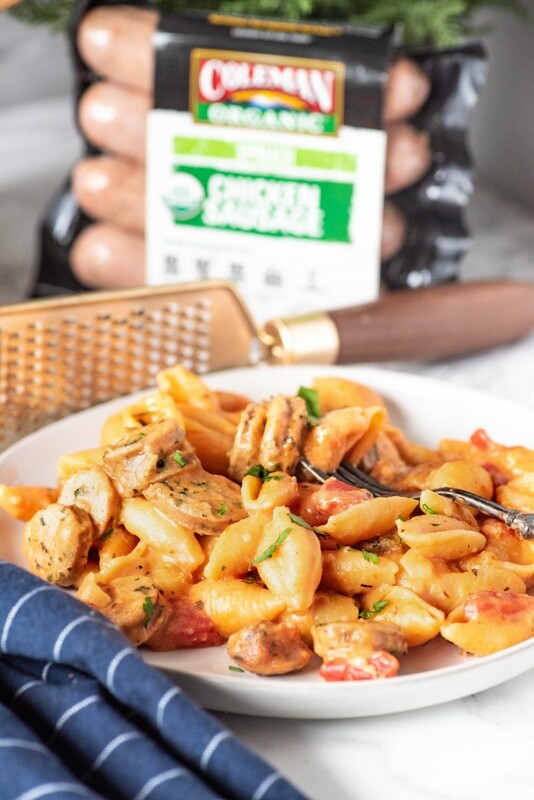 We particularly like the creamy Italian shells, because I always subbed out Italian sausage for the ground beef so that it had more of a homemade pasta flavor. However, it’s not exactly the healthiest thing, nor did I think that it made enough pasta for our family, so I decided to use COLEMAN ORGANIC® Organic Chicken Spinach Sausage to create a from scratch version of one of their most popular mixes (and our personal favorite). I was recently introduced to COLEMAN ORGANIC® products, and I am loving them! I always love ready made products that try and stay true to their original source with minimal intervention, so I dig the fact that their products are ready-to-cook meats that are made with ingredients I can pronounce, from real farmers who believe in raising animals the right way. I really do believe that there is a significant taste difference! 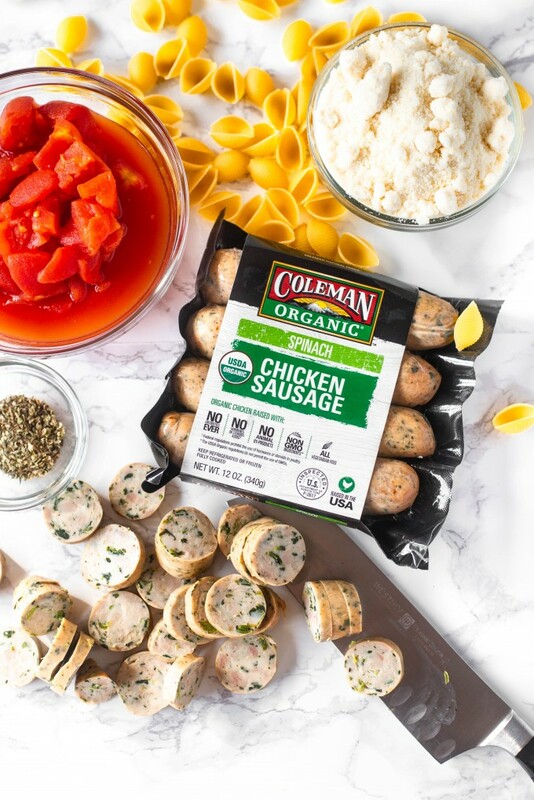 COLEMAN NATURAL FOODS® offers a complete line of organic meats such as chicken sausages, chicken hot dogs, breaded chicken breast nuggets, tenders, and strips, chicken meatballs, fresh chicken, uncured bacon, pork sausages, fresh pork, frozen chicken, beef and turkey burgers, fresh turkey and many other premium meats. For more recipes, coupons and promotions for COLEMAN NATURAL FOODS®, as well as where to buy COLEMAN NATURAL FOODS®, visit us! 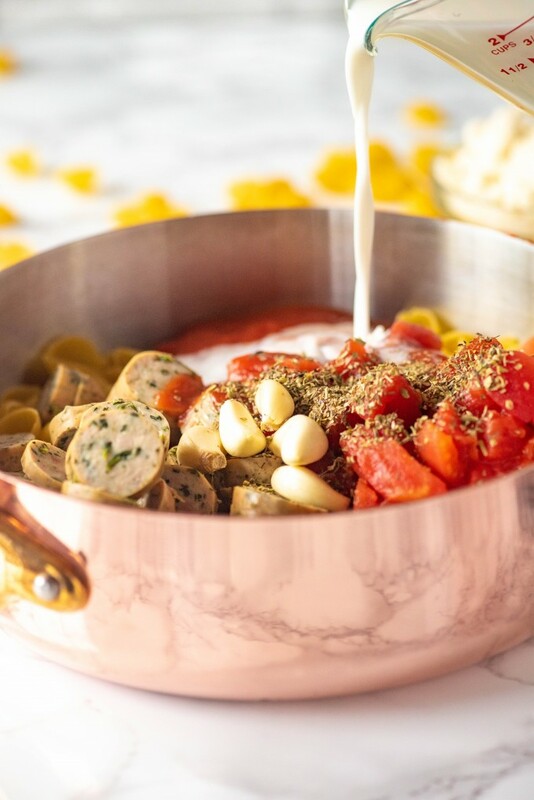 In a large, deep skillet or pot, add the shells, sausage slices, garlic, fennel seed, Italian seasoning, tomatoes, sauce, water, and milk. Stir to combine. Turn the heat to medium and bring to a simmer. Cover, reduce heat to medium low. Simmer for 15-20 minutes until pasta is al dente. Stir parmesan into pasta until melted, adding additional milk if necessary. Serve hot. I am chicken sausage skeptic (don’t know why!) but I took a chance on your recipe and I am now a chicken sausage convert! Bring on all the chicken sausage recipes! I love Coleman products and purchase their uncured bacon all the time. I’ll have to give this sausage a try as it sounds delicious. As to one pot meals, what would we do without them? This is a delicious looking dinner that will probably show up on my “oops I forgot to figure out dinner” night.